A sofa set is a very integral part of the interior design of the house. A living room cannot look complete without the elegant presence of a luxurious sofa set in the middle. Till now, Sofas were designed without many concepts and stitched and manufactured on local furniture markets but with changing times and sophistication in the tastes and preferences of the customers, making a choice in the array of sofas. Before choosing a sofa set, one must decide, what kind of mood he wishes to see in his living room. Some people have western tastes so they go for Italian or British look when it comes to choosing a sofa design. But in an Indian context, people have royal tastes and want to see some luxury in their living rooms. With this respect, they paint and decorate the room with luxury items and royal artifacts all around. A sofa set is thus chosen according to the color combination of the room and personal taste and preference of the owner. How big should be a sofa? An ideal sofa should be according to the available space in the room. It should not be huge and neither should it be so small that not enough people can sit on it. Though people think that a sofa would be better as much bigger it would be. Still, the area of the living room should be kept in mind so that space is maintained in the room for easy movement and spacious look. For most of the sofas, wood is the integral part of the material used. But today, even steel is also used to give a sleek feel to the overall look of the sofa. The royal design has an earthly feeling and thus often selected by most of the customers. The designs are traditionally Indian with flowers and creepers engraved on wood and then painted with golden paint to make it look costly and luxurious. There are various types of fabrics in the store which can be selected for the sofa set. Most of the people like to select some velvet like fabric so that it feels soft, costly and royal at the same time. Colors can be selected on personal discretion and according to the mood of the entire interior of the room. 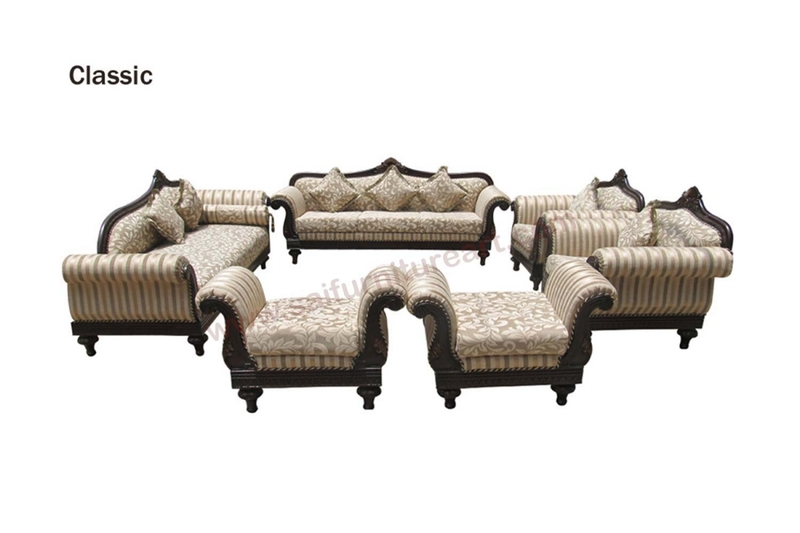 A royal looking sofa set gives a totally different look to the living room and also to the entire house. In a way, a beautifully carved sofa set gives a base to the home. Whether the family sits around together on the sofa or the guests enjoy their time around it, the sofa set makes people feel comfortable and at ease with themselves. Sai Furniture Art is a leading manufacturer of interior designing of royal and carved sofa sets and other living room furniture items from Kirti Nagar, Delhi.